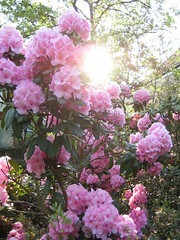 Quinton & I walked through Priory Park this morning, and my jaw dropped when I saw this rhododendron. The clusters of flowers are the size of my face. I headed out for a walk tonight and brought my camera to capture it and some other early summer blooms. The gardens in London are a pleasure I will definitely miss.